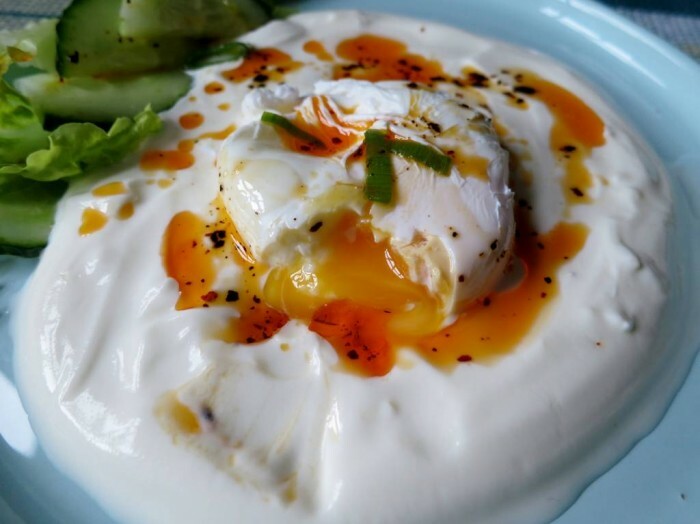 I hope you enjoy this delicious poached eggs in garlic yoghurt, Turkish Style, called Cilbir. I like to prepare a simple red pepper flakes infused olive oil sauce and pour this over the poached eggs with garlic yoghurt, just before serving. The delicious heat from the red pepper flakes complements the dish beautifully. Adopted from Ozlem's Turkish Table. Prepare the garlic yoghurt first – about 10, 15 minutes before poaching the eggs – and bring to the room temperature. In a small bowl, beat the yoghurt with garlic and seasoning. Spoon this into two serving plates, creating a round thick layer to provide a nest for the poached egg. Let the yoghurt mixture reach the room temperature. Fill a small pan with hot water, add the vinegar (this will help sealing the egg whites) and bring to a boil. Stir the water to create a whirlpool and crack in the first egg. As the egg spins and the white sets around the yolk, stir the water ready for the next one. Poach each egg for 2-3 minutes so that the yolk remains soft. While the eggs are poaching, quickly pour in the olive oil in a small pan and stir in the Turkish pul biber, red pepper flakes or chili flakes, over medium to high heat. Stir and let the red pepper flakes infuse to olive oil for a few minutes, turn the heat off. Lift the eggs out of the water with a slotted spoon and place them over the garlic yoghurt spread. Drizzle the red pepper flakes infused olive oil over the poached eggs. Serve immediately with pide bread or crusty bread by the side. Coban Salata, Shepherd’s Salad with cucumbers, tomatoes, spring onions would also go well with this delicious poached eggs over garlic yoghurt, Cilbir; Afiyet Olsun.